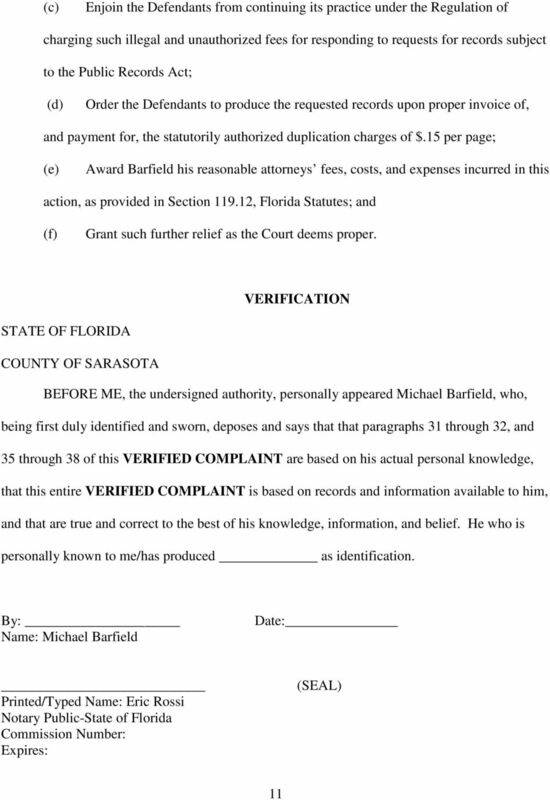 Download "IN THE CIRCUIT COURT OF THE TWELFTH CIRCUIT IN AND FOR SARASOTA COUNTY, FLORIDA"
1 MICHAEL BARFIELD, IN THE CIRCUIT COURT OF THE TWELFTH CIRCUIT IN AND FOR SARASOTA COUNTY, FLORIDA Plaintiff, Case No. 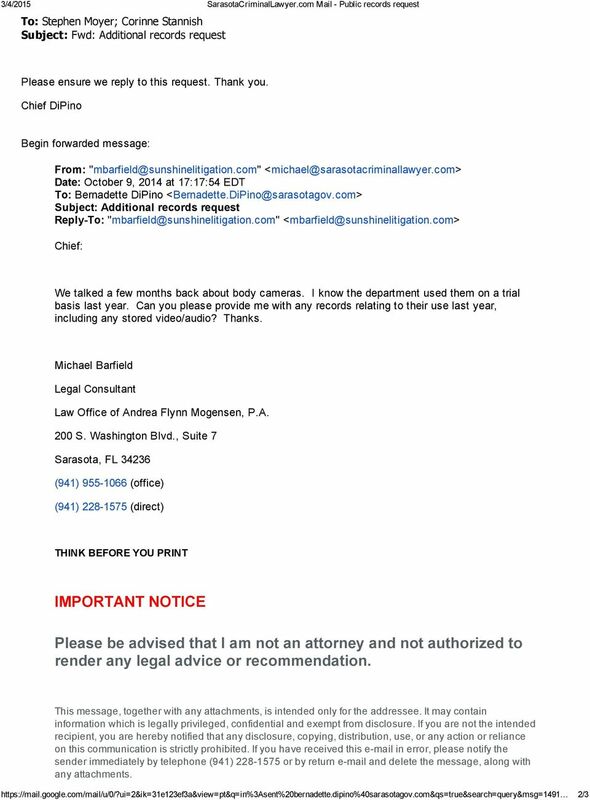 : IMMEDIATE HEARING v. REQUESTED PURSUANT TO Fla. Stat (2009) BERNADETTE DIPINO, in her capacity as the Chief of Police for the Sarasota Police Department, and the CITY OF SARASOTA, a Florida municipality, Defendants. 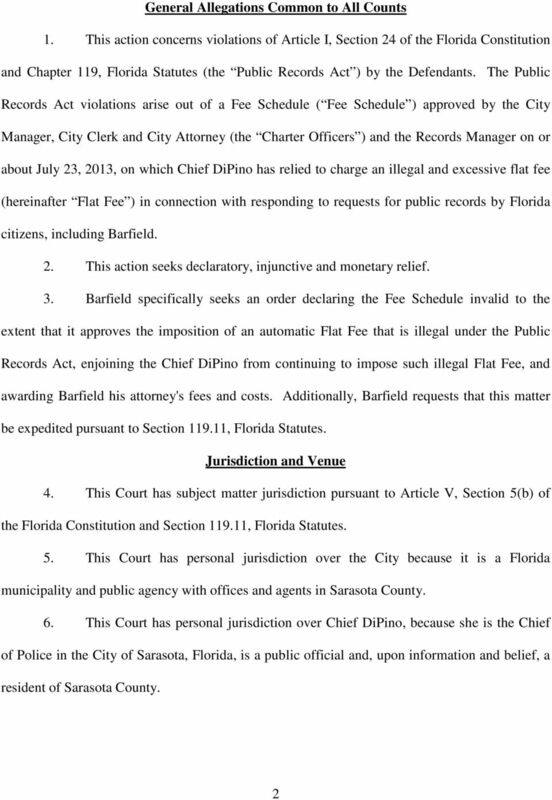 / VERIFIED COMPLAINT TO ENFORCE FLORIDA S PUBLIC RECORDS ACT AND FOR INJUNCTIVE AND DECLARATORY JUDGMENT Plaintiff, MICHAEL BARFIELD (hereinafter referred to as Barfield ), by and through his undersigned counsel, sues BERNADETE DIPINO, ( Chief DiPino ), in her capacity as Chief of Police of the Sarasota Police Department, ( SPD ) and the CITY OF SARASOTA, a Florida municipality ( the City ) (collectively the Defendants ), and alleges as follows: Introduction This is an action seeking declaratory relief for violations of the Florida Public Records Act by SPD, an agency of the City of Sarasota, Florida. 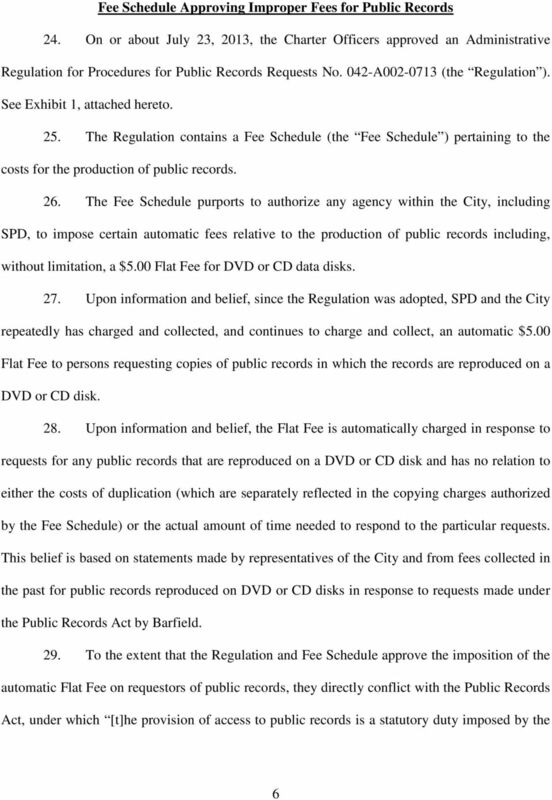 Plaintiff contends that SPD has an administrative policy to overcharge for access to public records by charging $5 for a CD or DVD disk even the actual cost of reproducing public records on a disk is less than 25 cents. 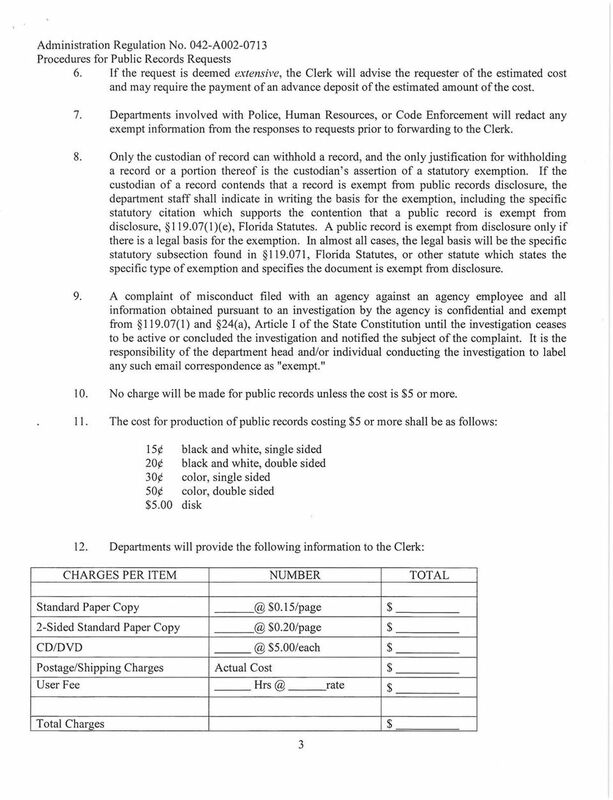 The agency s policy is to make a profit from having to comply with public records requests to discourage citizens from making such requests. 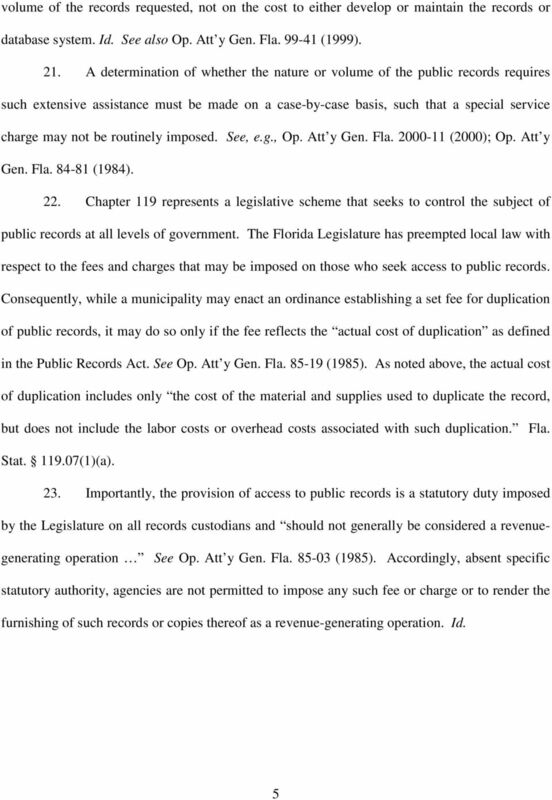 This policy violates the Public Records Act because an agency may only charge the actual costs incurred in reproducing public records. 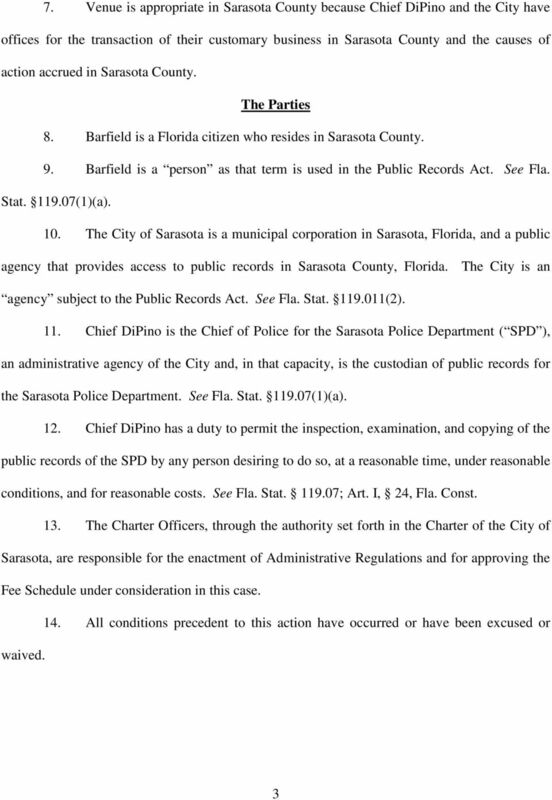 When will the City of Tampa respond to my records request? 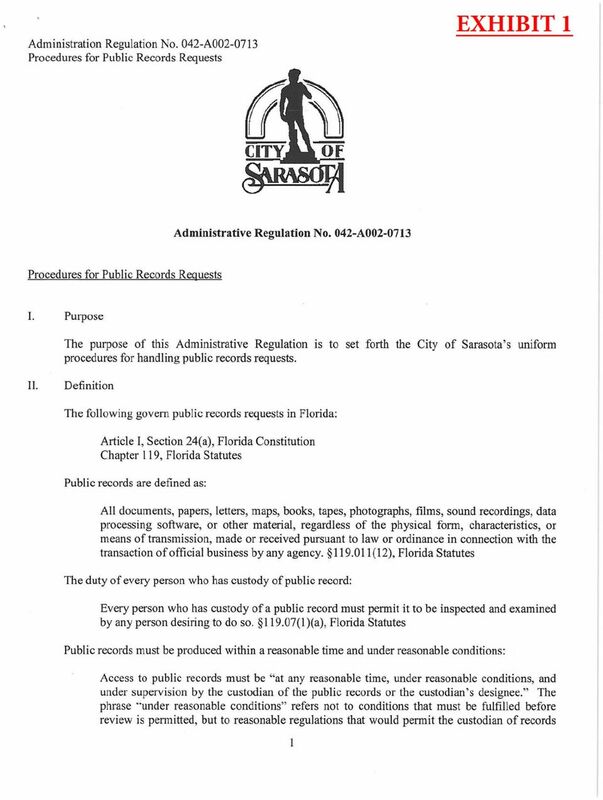 What records are not open for inspection or will not be disclosed? 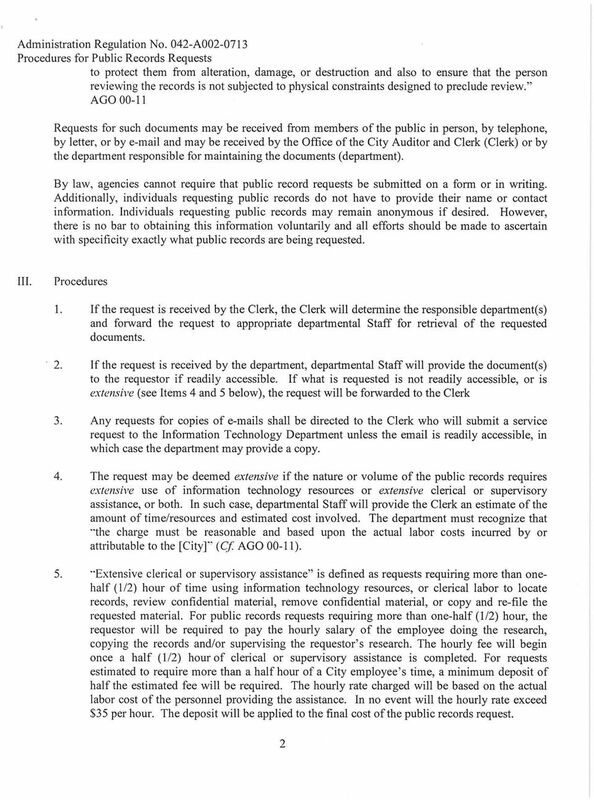 How to Request Public Records What are public "records"? 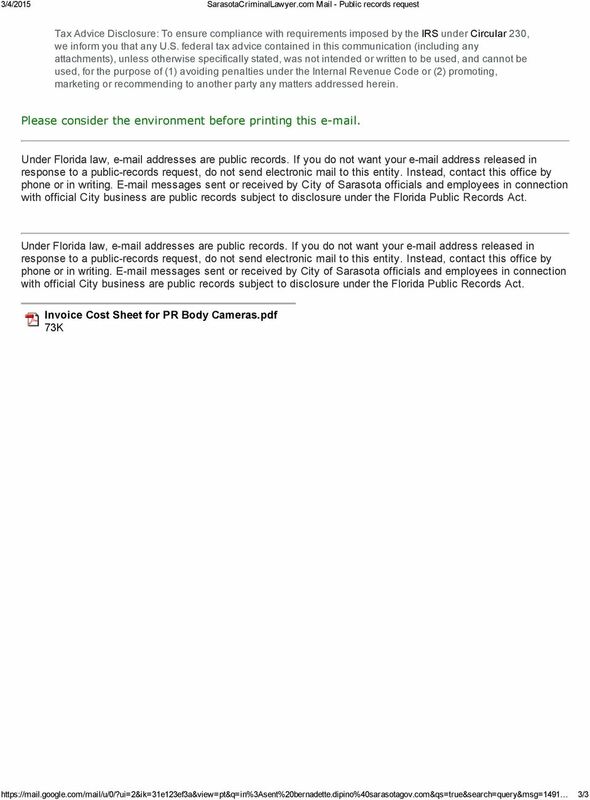 How can I request a public record? 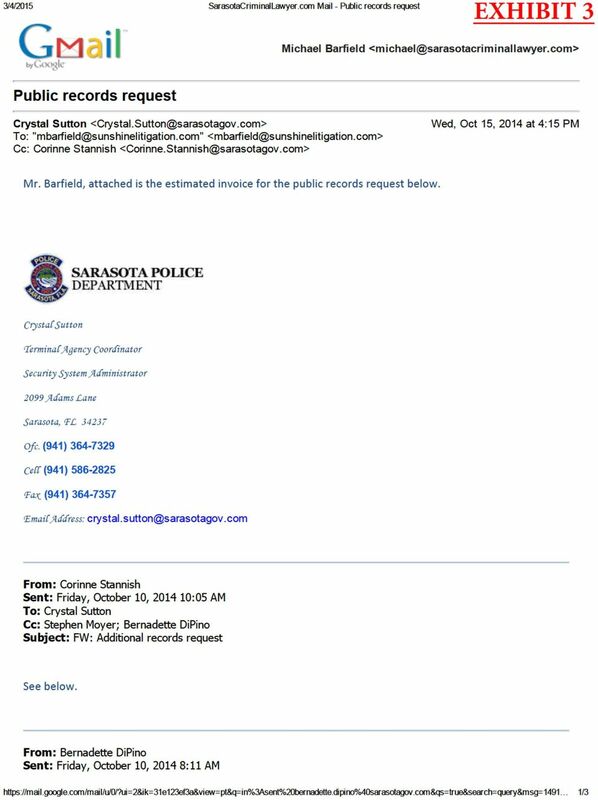 How can I request a readily available document? Are there fees involved? How do I pay for records retrieved? CASE NO. 1D14-2653. 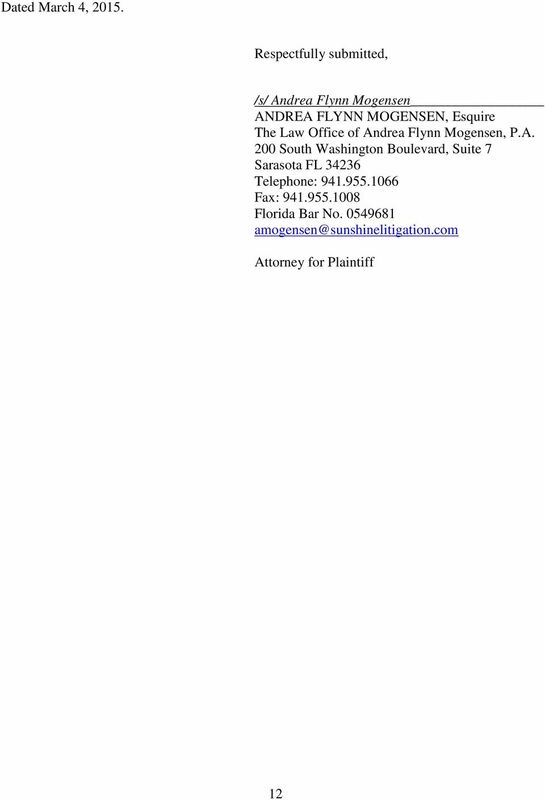 Karusha Y. Sharpe, John K. Londot and M. Hope Keating, of Greenberg Traurig, P.A. Tallahassee, for Appellee. 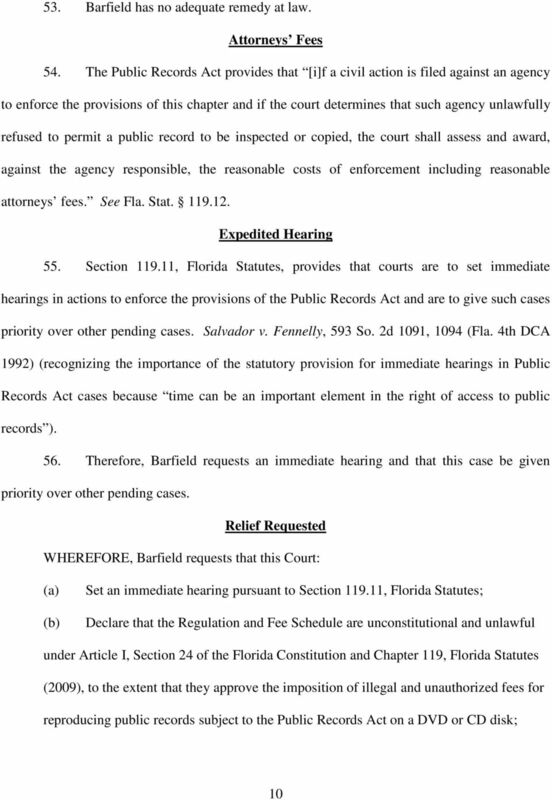 IN THE DISTRICT COURT OF APPEAL FIRST DISTRICT, STATE OF FLORIDA CONSUMER RIGHTS, LLC, v. Appellant, NOT FINAL UNTIL TIME EXPIRES TO FILE MOTION FOR REHEARING AND DISPOSITION THEREOF IF FILED CASE NO. CAUSE NO. 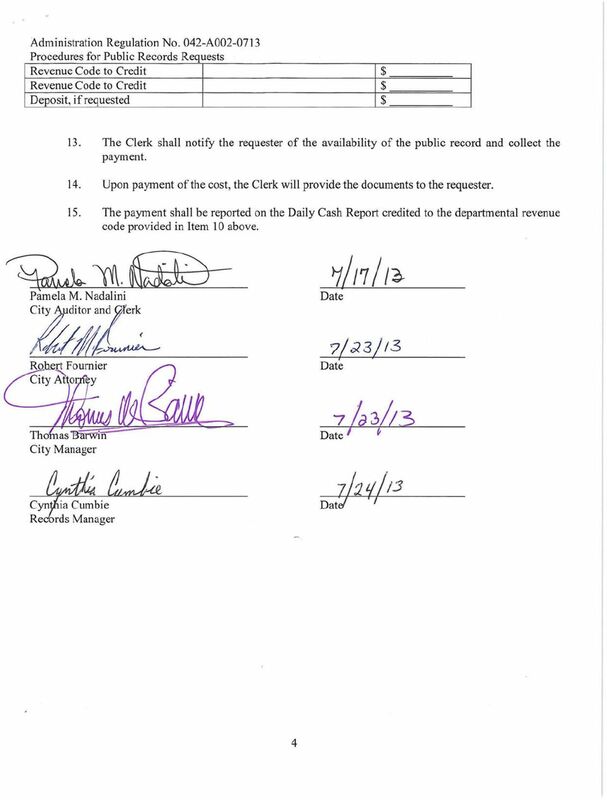 Filed 13 July 19 P3:43 Sherri Adelstein District Clerk Denton District ACE CASH EXPRESS, INC., IN THE DISTRICT COURT OF Plaintiff, v. DENTON COUNTY, TEXAS THE CITY OF DENTON, TEXAS Defendant. 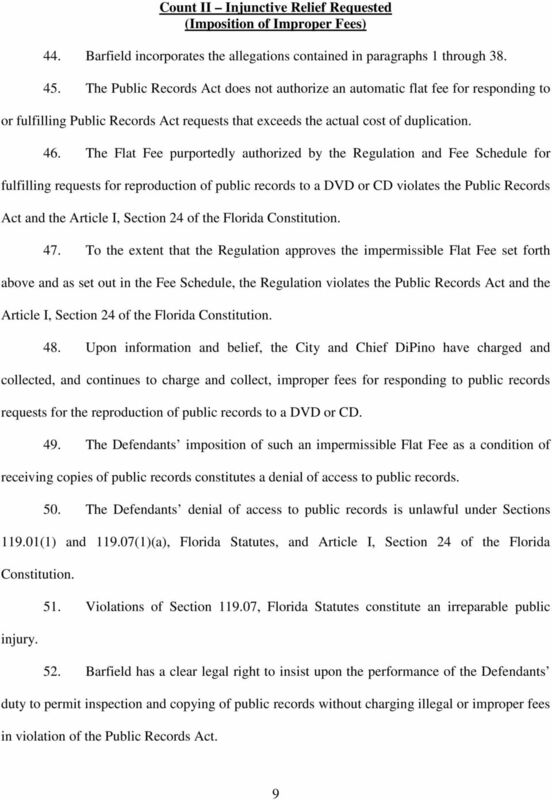 IN THE CIRCUIT COURT OF THE 7 TH JUDICIAL CIRCUIT IN AND FOR VOLUSIA COUNTY, FLORIDA BENJAMIN T. BROWN, Plaintiff, CASE NO. 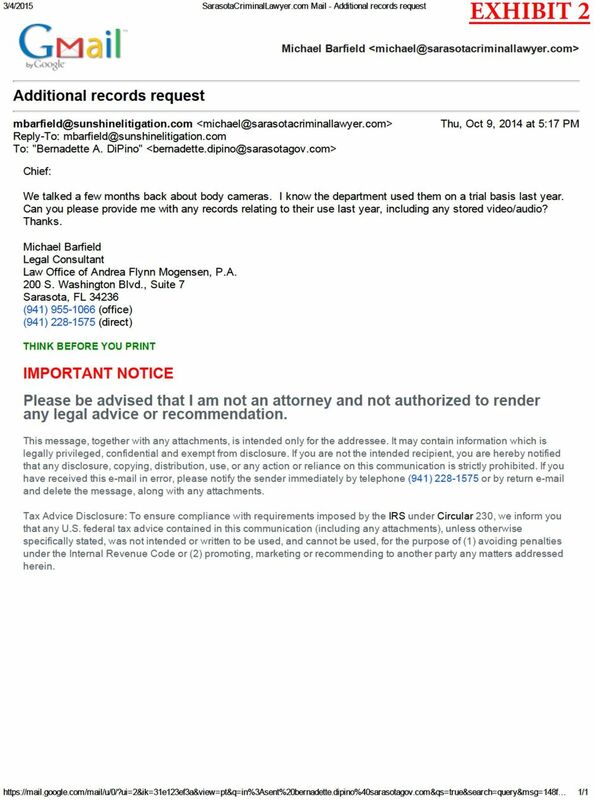 v. NORTHWESTERN MUTUAL LIFE INSURANCE COMPANY; A foreign corporation. Defendant.